An image of the right panel was used as the illustration of the back of the book jacket of Osaka Prints by Dean J. Schwaab, the 1989 edition. Both prints appear in color on pages 150 and 151. 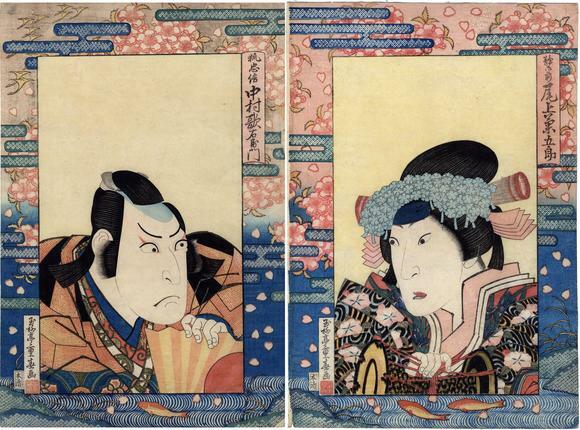 Schwaab wrote: "This pair of bust portraits depicts the only performance in which Utaemon III, Rikan II, and the visiting Edo actor Onoe Kikugorō III... performed together. The design of these framed portraits is quite clever. The faces and robe patterns are contrasted with a simple yellow ground, taking the eye to the border. The border resolves downward as the falling petals carry the eye from clusters of flowers through the merging blues and conventionalized mist to the rippling pool where goldfish hang suspended. The border carries the title of the play, The Thousand Cherries of Yoshitsune, as well as signifying mortality. The borders seem to move while the portraits are still." If by "carries the title" Schwaab means to imply that the design of the border is symbolic, then he is correct. If, however, he means this literally, he is mistaken. The cartouches in the upper right of each print give the names of the actors and the roles they are performing. The cartouches in the lower left are the artist's signature and seal. The yellow seal nearby is that of the publisher.